Basement Flood Protector offers waterproofing services which include interior and exterior drain tile systems, gravity drains, french drains, trough drains, foundation crack repairs, interior and exterior foundation resurfacing, exterior membranes, crawlspace vapor barriers, downspout engineering, lift stations, catch basins, window wells, concrete extensions, foundation reinforcement, fortress strapping, steel bracing, escape wells and many others. We also offer sewer backup options that include full and modified overhead sewer conversions, and back water valves. Basement Flood Protector has a long track record of performance. Why Choose Us for Basement Waterproofing? We specialize in homes new and old. Whether your property has a stone, poured concrete, cement block, brick, sealed stone, limestone, or telephone tile foundation, we can customize a waterproofing package specific to YOUR property. Fractures in your foundation wall can occur at any time throughout the life of the structure due to settling. Basement Flood Protector offers several interior repair methods and backs them up with a lifetime transferable warranty. Our experienced staff will determine which method is right for your property. Polyurethane is flexible and is not a structural repair, however, it can prevent leakage. It starts out with low viscosity, then expands and hardens in the crack. Epoxy is as strong as concrete and forms a structural seal, however, it hardens slowly and if there is space at the back of the crack, it will leak out. Interior drain tile systems are put in place to prevent hydrostatic pressure from occurring. Water seeks its own level and since concrete is porous water can seep through the concrete. 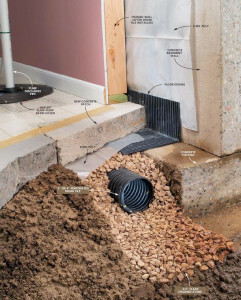 Drain tile systems are strategically designed to catch the water that flows down the exterior of the foundation before it collects under the house. A drain tile system has many components to keep your basement dry, not only during rain events but also on a day to day basis. An interior drain tile is comprised of 4″ perforated pipe engulfed with stone along the footing, under the concrete floor and around the entire perimeter of the basement or crawl space. A sump basin is then installed with a sump pump and the drain tile is installed with a pitch and connected to the sump basin. The water is then discharged out of the house with a sump pump.